Rob is the Associate Dean of the Aviation Maintenance Technology Program at Everett Community College. 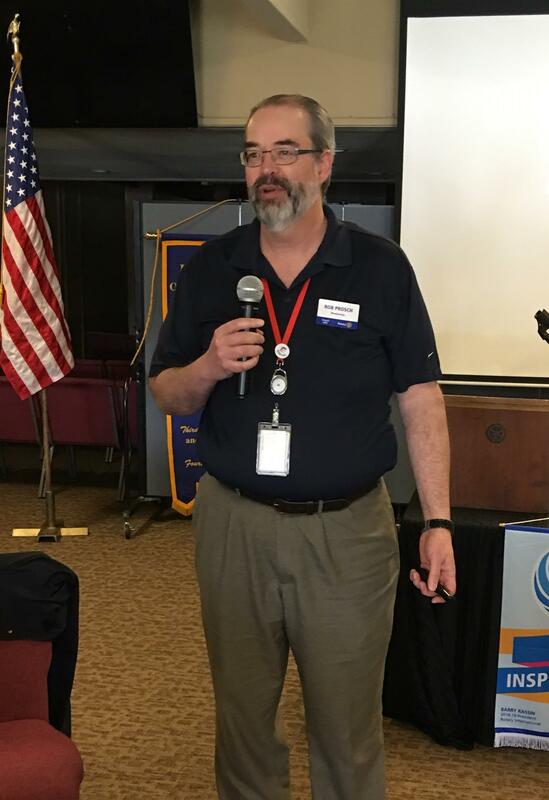 He is a member of the South Everett/ Mukilteo club and is the District 5050 Membership Chair. The program is FAA regulated and all students need to meet all FAA regulations and state regulations. FAA inspects the program on a regular basis. There is a shortage in the Aviation Technology field. Because of this shortage salaries have gone through the roof. Students leave the program making $80,000 per year plus overtime. Students also have a 99% placement rate from the program. Program has been at Paine Field over 51 years. They also run the Avionics program. This is all the electronics on the aircraft. This program trains them to deal with all the technology on the plane. They have an A&P Test Prep program. Almost all student go through this program, also. They have an industrial painting 40 hour program. Also have a composites program. Also looking at other programs to add and grow the division. Mechanics need to have FAA licenses to work on a plane. To do this they need to have Certifications in Airframe Rating and Powerplant Rating. There are 180 aviation technology schools in the US. This is on a rebound as many shut down a few years ago. There are 5 in Washington State. The curriculum is the same, but the order they do things in is different. There are certificates available in Aviation Maintenance technology, Aircraft Electronics, Aircraft Wiring, Airframe/Avionics, Aviation Maintenance Technology. This can transfer to Clover Park for a BAS. All of these have different timelines and are able to be combined for different needs. 2.4% of the entire aviation industry is female because aviation came out of the military, so it has been highly white male. Requirements for the program are that they need to be 18 years old. They need to read, write, speak, and understand the English language. They need to have no drug, alcohol, or felony offenses and need to pass a TSA evaluation. They need to be able to read and write English because the language of aviation is English around the world. Students spend 2-3 hours per day in theory and 3-4 hours in lab and hands on projects. They go to school 5 days per week, 6 hours per day for 4 quarters. They move through the program as cohorts. The program has 160 students at this time. FAA mandates a minimum amount of attendance hours. EVCC requires a minimum of 2,227 hours must be attained. The AMTS program costs $20,000 for the 2 year program.